Love a little taste of hearty German food? 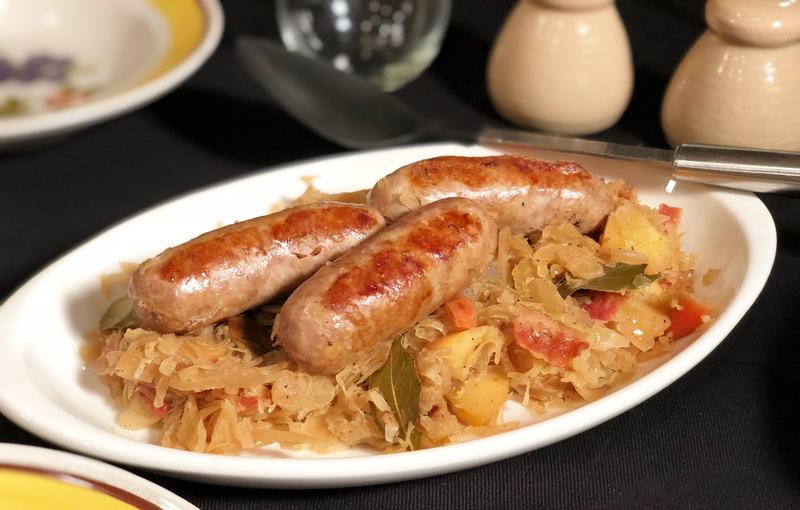 Whether you’re exploring your heritage through classic recipes or branching out with your palate, this sweet and savory bratwurst dish will bring you straight to the Motherland. Here’s how to make your own. 1. In an enameled cast-iron casserole dish, add two tablespoons of vegetable oil and bacon and cook on high for about five minutes until the bacon becomes crispy. Drain and set aside on a plate lined with paper towels. 2. Next, add your onions to the casserole dish, cover and cook on low for about 20 minutes until soft, then increase your heat to medium-high and add your berries, bay leaves, apple, wine, sugar, salt and pepper. Boil for three minutes before adding in the water and sauerkraut, then reduce heat to low again and simmer for about 45 minutes. 3. In a large skillet over medium-high, add the rest of the vegetable oil with the bratwurst. Cook for about eight minutes until golden brown and firm, turning each link over multiple times to brown evenly. 4. Spoon your seasoned sauerkraut mixture onto a serving platter, arrange your bratwurst on top and sprinkle with bacon, then serve with grainy mustard. Guten Appetit! Love our full-flavored German Bratwurst? Try all our real Italian sausage and world flavors when you search for Premio sausage varieties in a store near you.